Can you "buffalo" anything? Some say yes, and they're putting spicy, vinegary sauce on all kinds of things that aren't chicken wings. Here are 11 frankenfoods that people are making with buffalo sauce. Buffalo cauliflower. A go-to buffalo chicken wing substitute for vegans and vegetarians, buffalo cauliflower uses a similar formula for spicy snack-ability as their carnivorous cousin- bread it, bake it and toss in buffalo sauce. Buffalo cornbread. When chili is just not spicy enough, cornbread can pick up the slack. Adding a little buffalo sauce to cornbread batter gives chili’s best friend extra punch. Buffalo superfoods. Snacking + football typically means unhealthy, heavy food. To ease that Monday morning guilt, buffalo quinoa bites or crunchy buffalo kale chips have been added to the buffalo recipe roster. At least they pack some nutrition into the tailgating spread. Buffalo squash cakes. It’s football season. The farmers’ markets are exploding with squash. Adding a teaspoon of buffalo sauce to grated squash and a few other ingredients makes for a seasonal and football-friendly snack. Buffalo fried pickles. Fried pickles and Buffalo wings are already bar snack favorites, but giving the pickles the buffalo treatment combines the best of both worlds. Buffalo pierogis. Pierogies are traditionally filled with cheese and potatoes among other things. Blue cheese pierogies tossed in buffalo sauce is a natural progression, right? Buffalo popcorn. This popcorn preparation keeps the popcorn crisp after drizzling with butter and hot sauce. Spicy, tangy and crispy. Buffalo-ed bacon. This was probably inevitable. Bacon has been candied and covered in chocolate—why not give it the hot sauce treatment? Buffalo Salmon. 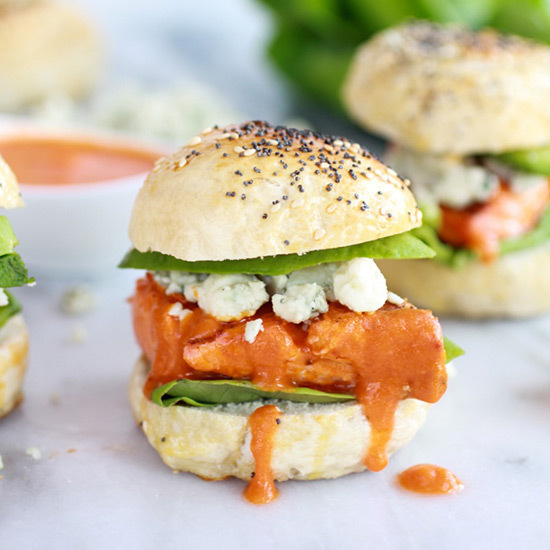 Half Baked Harvest’s recipe for Buffalo Style Salmon Sliders updates the bite-sized burger by stuffing grilled salmon filets glazed with buffalo sauce and topped with crumbled blue cheese into adorable Everything Bagel Slider Buns. Buffalo mashed potatoes. A blank canvas full of savory possibilities, mashed potatoes combine brilliantly with blue cheese, but buffalo sauce? This is new territory.